Bradford is set to kick off their official training camp for the 2011-2012 season. 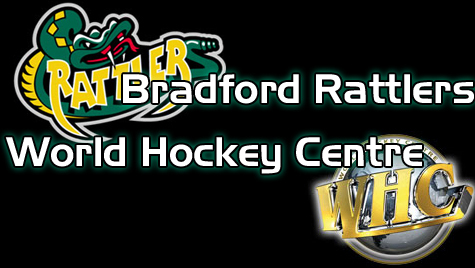 Eleven more players joined the Rattler’s at the World Hockey Centre. The team will be staying in-residence at WHC, with the two week camp beginning on Monday August 22nd. The player’s joining camp this weekend include: Mike Telford, Lious Malliard, Andreas Norby, Jakub Kachman, Corey Klimas, Alex Drulia, Carson Bird, Ugo Jaffeau, Alex Bangertt, Viktor Ahlund, and Alex Polischuk. On May 5th, 2011, the Bradford Rattlers traded the rights to Tye Greschuk to the Sturgeon Falls Lumberjacks in exchange for Mike Telford. The deal has officially been processed and confirmed by the league, meaning Telford will be wearing a Rattler’s jersey next season. Mike is a two year veteran of the league. The 21 year old defenseman stands 6’0”, weighing 200lbs. Last season with the South Muskoka Shield, Telford notched 6 points and 37 PIMs in 21 games. Louis Maillard is a 5’8” forward hailing from Switzerland. He split last season between Switzerland3 Hockey league and the Elite Junior B league. In total, Milliard recorded 15 points in 32 games. Andreas Norrby is a big power forward from Stockholm Sweden. Norrby has played five years of junior in Sweden already; last season he scored 9 points in 27 games in one of Sweden’s top leagues. He stands 5’9” and weighs 201lbs. Jakub Kachman is a speedy Slovakian forward, who brings a positive energy to the club. Kachman stands 5’8” and weighs 155lbs, as a 16 year old. He has been training at the World Hockey Centre program earlier this summer and was signed from the camp. Bradford has signed their first round pick from the 2011 GMHL Entry Draft. Corey Klimas will be reporting to the Rattlers next season. The Canadian is expected to have a big presence in the Rattler’s line-up next season. Ugo Jaffeax, from France, will be returning for another season. Last season with the Rattler’s, Ugo recorded 8 points in 34 contests. Ugo had played three seasons in France’s top leagues before moving to Bradford. Alex Bangertt is also returning for another season. The 19 year old German forward was able to contribute 8 points (3g, 5a) in 30 games last season. Carson Bird arrives to camp expected to battle for the starting goalie job. The junior hockey veteran has a big net presence, with a quick glove hand. Another forward, Alex Drulia, from Fort Erie, Ontario will be joining the club. Alex is aged 16, stands 5’10” and weighs 180lbs. Viktor Ahlund will also be a contender for the starting job this season. Viktor is from Kristianstad, Sweden, stands 6’2” and covers a lot of net. Ahlund played Division 2 in Sweden last season. Before that he played Junior A hockey in Sweden and also spent a year in prop school for Lyndon Institute in Vermont where he was a starter. Viktor is trying to go to College for next year. League Veteran Alex Polischuk will be returning for his fourth season with Bradford. The Russian defensemen stands 5’9” weighing 202lbs. Alex notched a career high six goals and 35 assists in 41 contests last season, leading all Rattler defensemen in points. Alex has also named to the GMHL All-star game for two straight seasons. All of these players are reporting to the World Hockey Centre for their two week training camp. Bradford is very excited for the upcoming season as they try for their third Russell Cup.